BMW is undoubtedly one of the top names among the best luxury car makers in the world. Its cars assure superiority in terms of elegant looks, innovative engineering, greater level of comfort as well as performance. It’s always a “never-before” experience to ride a BMW steam. This famous German brand is usually associated with high-priced makes that are mostly accessible to the wealthy elites. It’s always like a dream to own one of the most expensive cars from BMW. So, looking for more? Well, here goes a list of most expensive BMW cars. 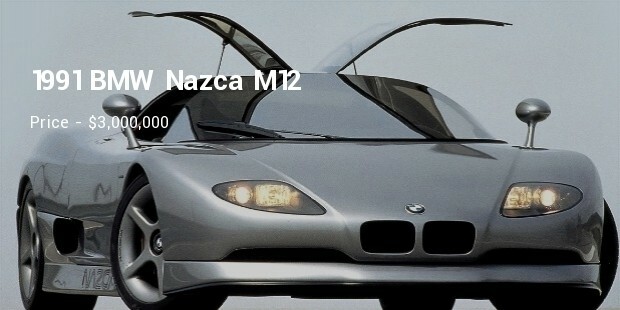 BMW took suave to a new level with its launch of Nazca M12 in 1991. The most expensive of the lot, this amazing steam is equipped with 5 l engine displacement capacity and it assures around 300 bhp power. The car weighs around 1100 kg and its bhp/weight is 273 bhp/tonne. The dashing car is backed by 5.7 l engine displacement capacity and it assures 380 bhp power. It weighs around 1000 kg and its maximum speed is 325 kph. The bhp/weight of the car is 380 bhp/tonne- it looks quite a deal. 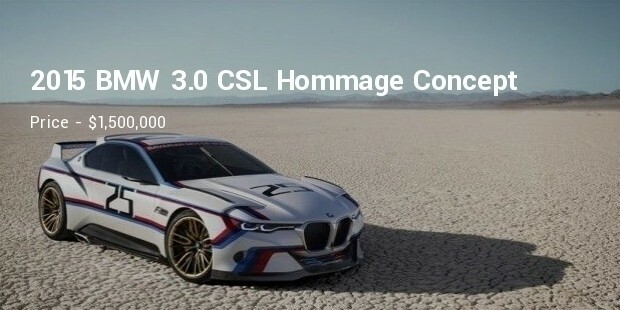 The CSL Hommage Concept carries on the legacy of stunning looks as assured by BMW temperament. The car comes equipped with 3 l engine displacement capacity and produces 430 bhp power. Its bhp/weight is 287 bhp/tonne and maximum speed is 280 kph. 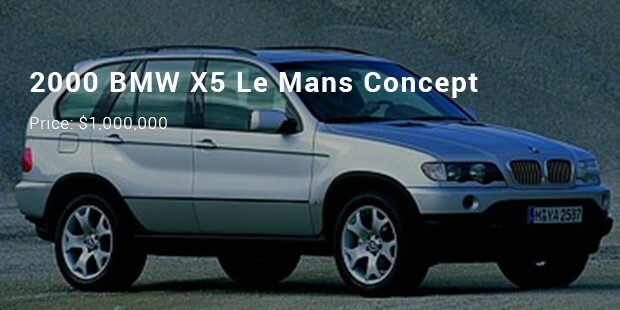 The X5 Le Mans Concept is another one of the most coveted cars from BMW. The car is backed by 6.1 l engine displacement capacity and it assures 700 bhp. It weighs around 2100 kg and its maximum speed is 311 kph. 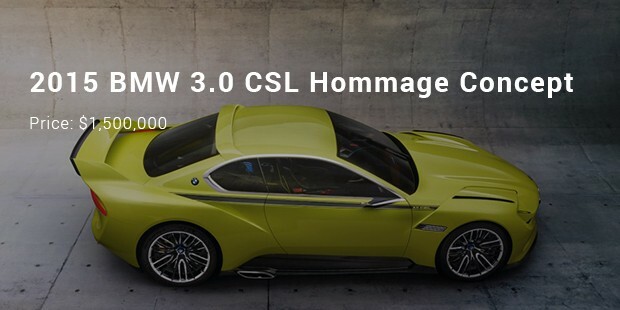 2015 BMW 3.0 CSL Hommage Concept is another interpretation of the 1970s BMW Sports Car. 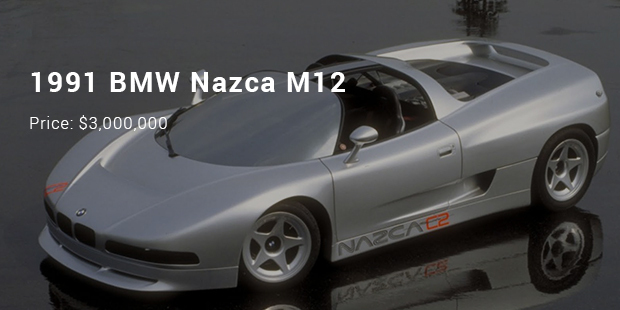 This two door sports car has some features that will amaze you. They are boot wing and roof spoiler with seminal silhouette, air deflectors along the bonnet, and aluminium and plexiglass windows. 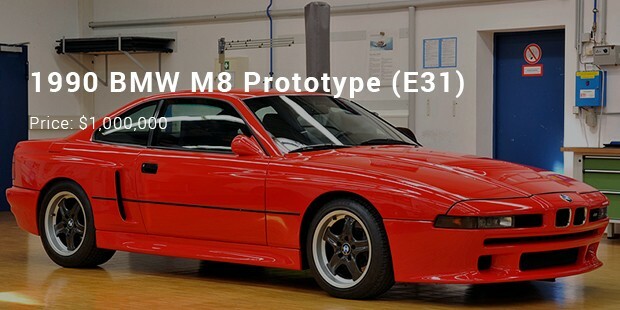 BMW M8 Prototype was a mystery to many as it was designed and ready to be brought to the market. Yet it did not reach the market. Some of the features of this mysterious car are power bulge hood, revised air dam, and specialized ducts to channel air. M8 Prototype was known for its extraordinary performance and many are disappointed it was not given to the customers. 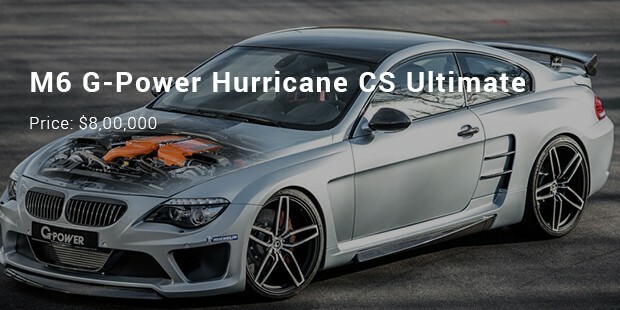 Positioned as a sports car with the superlative G-Power, BMW M6 G-Power Hurricane CS Ultimate is just amazing. You will surely admire its twin supercharger engine, individually adjustable suspension kit, carbon ceramic break system, multipart wide body kit, and G-Power Wheels. 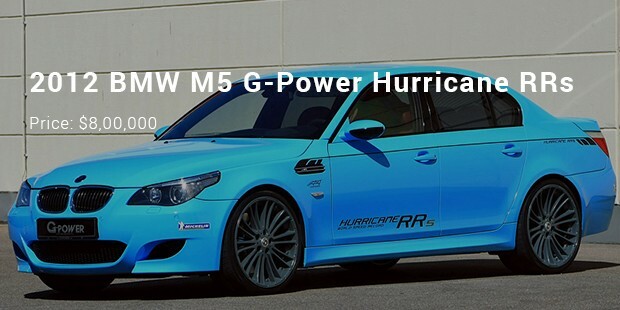 BMW M5 G-Power Hurricane RRs has enhanced performance with its twin supercharger engine and 800 hp. Other features in this car are high revving V10 engine, bio compressor Sport Drive System, and an Alph N engine management system. 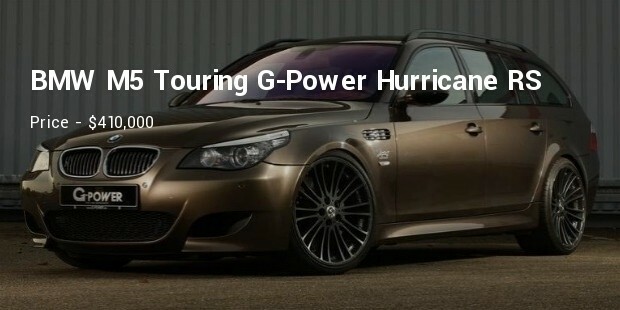 Touring G-Power Hurricane is a car that reaches a speed of 372.1 km/h. The engine displaced 5 litres of fuel from the 10 cylinders and has a supercharger. Other features include 790 Nm torque, 820 hp and f 20-inch G-Power Silverstone RS wheels. 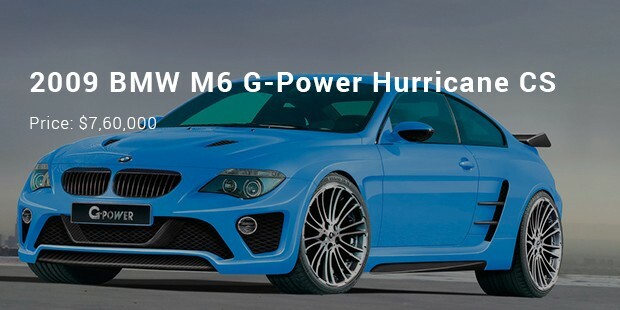 BMW M6 G-Power Hurricane CS is also a twin supercharger engine car with G-Power technology. This car has V10 engine with 590 lb torque, carbon fiber seats, 740 hp, and a speed of 230 mph. The speed of 230 mph makes it the fastest BMW on earth. 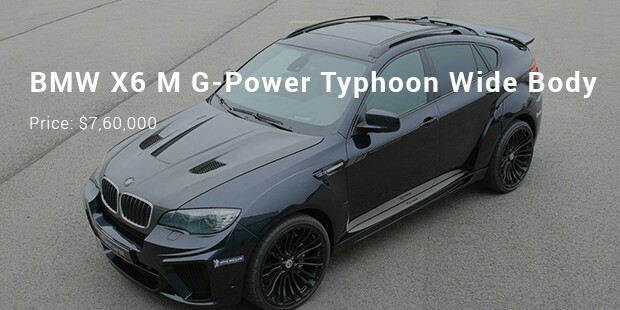 2012 BMW X6 M G-Power Typhoon Wide Body is a car with maximum aerodynamic capacity. This BMW also uses G Power making it fast. The wheels have flared wheel arcs and spoilers and skirts. BMW with a 4.4 liter V8 engine and electronically regulated torque and you can ride at speeds of 186 mph with 725 horsepower. 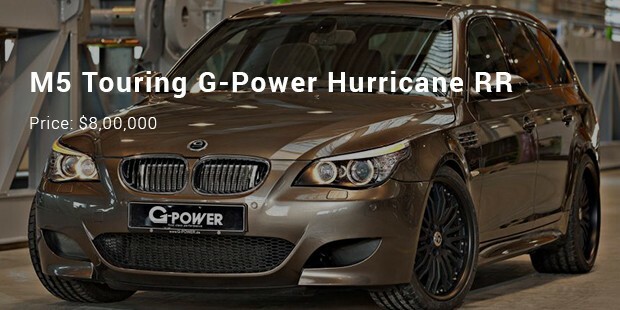 With G-Power this BMW can beat many other cars on the road. Riding at a speed of 235 mph this monster can allow you to beat anyone on the road. After three decades of intense research BMW has released this version. It has features like 5 liter V10 engine, water cooled intercooler, G-Power Silverstone Diamond wheels, and the like. 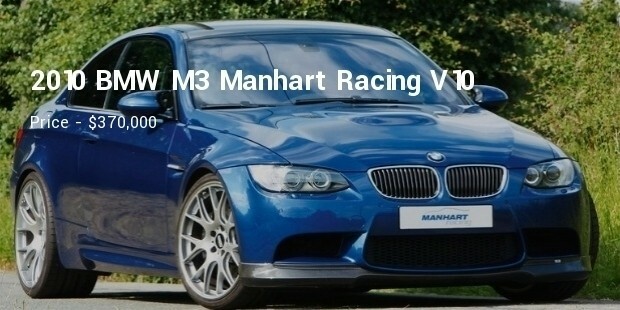 2010 BMW M3 Manhart Racing V10 is rated along with Porsche 997 turbo. 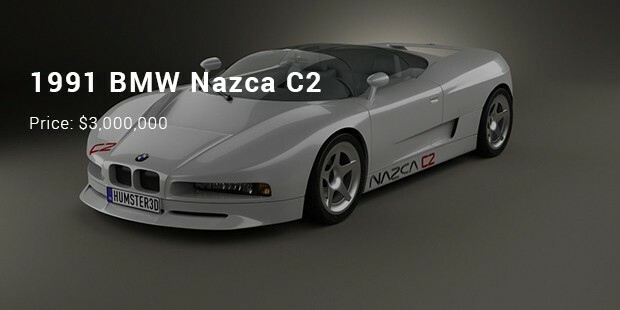 This car boasts of a differential gear, catalytic convertor, and 7 gear SMG gearbox. This BMW travels at a speed of 334 km/hr. The most expensive BMW cars have been rightfully tagged high for their amazing design, state of the art engineering, superior performance and innovative nuances. These are mostly meant for the wealthiest niche who does not mind splurging for the best of the best in the market.